I have - to date - experienced the most energy-tapping paddle in my life. Crossing a bay of 20 km, facing strong currents, is a hard and tough paddle. To complicate matters, I tried two crossings. Sept 22: After a great evening with new friends, Sergio and Irena, I got up early to get the calm conditions. Heavy dew. Everything soaked. Will have to dry at lunch. We leave "Brian," a small village that grows 20 times during the summer, and wonder what will be around the next corner. We head out through the waterways, finding routes and moving forward. Paddling in silence collects my thoughts. Been thinking about all the people I have met. Most everyone has the same equation for life: they want security of employment to provide for basic needs, they want to assist their children in every possible way to move in the right direction, and they have dreams; things they wish to do. People just want to make ends meet and find personal contentment. Many are not envious of those who have more, they find happiness in where they are, the people around them, and contributing to society. These provide a sense of meaning and worth. Paddle silently beside some interesting thatched structures on our way through Caorla Veneto. Slowly and surely we make our way across Latina di Marano. By map it looks possible, but low tide conditions make this a jigsaw puzzle. Spotting a vacant beach, we go for it. Got to get that tent up before sunset. 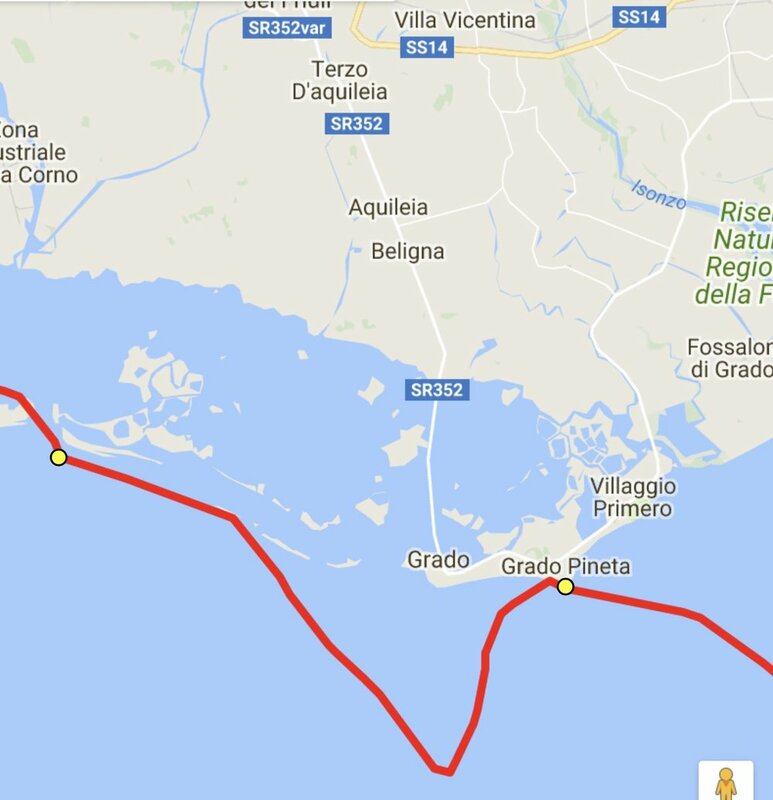 After 47 km, A safe haven is once again secured close to Portobuso. Another heavy dew. Tents are soaked. Just pack the gear - sand and all- and will take everything out to dry at noon. We decide to take the outer route. The sea is very calm and paddle a good 10 km without problem. In the distance is a tip of land. It's Slovenia. We go for it. After 900 meters, we encounter major currents. We progress steadily but not far. Seems like 5 strokes for every meter. I see a fisherman and head to his boat. I had problems holding on to the boat. Wow. Got to get out of this. Retreat and head to Grado Pineta. It took us two hours from where we turned to reach Grado Pineta. That was a hard, hard paddle. After a hearty lunch and two hour break, we set out again. We will paddle across the bay. If it gets too hard we will retreat. This lady knows how to make a nice meal. Retreat is not an option. The locals said this crossing was 12 km. By our calculations, it was actually 23 km. 4.5 hours later, I paddle into Izola, Slovenia. Endre and I finally arrive. Though a challenging crossing, it was beautiful and picturesque. Happy to be on shore. Accomplishment. Though life can be hard, small accomplishments provide a sense of satisfaction. I am thankful for each kilometer. Thankful for my children and the years of good memories. Yes, life is challenging and we sometimes just have to endure the rough roads. But that is life, part of our own individual journey. LOL. And sometimes during our challenges we can fish.